Today’s guest(s): Gregory Tracy, Managing Editor of the Pilot Newspaper. Today’s topics: Cardinal Seán and Pope Benedict deliver messages to the pilgrims in Madrid for World Youth Day, a petition in support of euthanasia is submitted to the Massachusetts Attorney General, and Fr. Rich Erikson reflects on closing his term as the Vicar General. 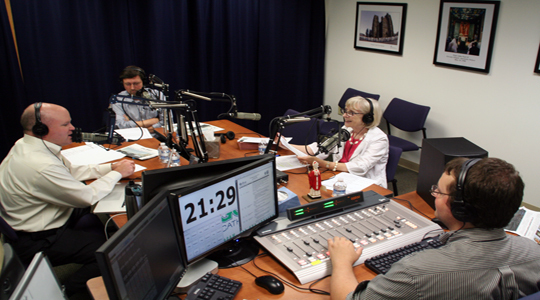 Summary of today’s show: Scot, Susan, and Greg discuss messages at World Youth Day and local and international Catholic news. 1st segment: Scot welcomed Susan back to the studio, as it’s been a while since they co-hosted a show together. Susan explained that, contrary to what we said on the show two weeks ago, she was not on vacation – she was at a conference in Springfield with other catechists. Reporter John Allen was the keynote speaker for the event. Susan said she was also at CatholicTV last week talking about Catechetical Sunday, which is coming up on September 18th. Susan explained that John Allen spoke about his most recent book, The Future Church, about ten trends he sees, and said the book is hopeful work from an objective writer. She said one of the biggest trends Allen identifies is that the Church is no longer a Church of East and West but of North and South. Scot recalled a column where Allen shared his themes, and said he agreed with Allen’s analysis of a shift in our Church to South America and Africa. Dear young people, listen closely to the words of the Lord, that they may be for you “spirit and life” (Jn 6:63), roots which nourish your being, a rule of life which likens us – poor in spirit, thirsting for justice, merciful, pure in heart, lovers of peace – to the person of Christ. Listen regularly every day as if he were the one friend who does not deceive, the one with whom we wish to share the path of life. Of course, you know that when we do not walk beside Christ our guide, we get lost on other paths, like the path of our blind and selfish impulses, or the path of flattering but self-serving suggestions, deceiving and fickle, which leave emptiness and frustration in their wake. Scot highlighted that Pope Benedict is addressing a common theme – that youth have pressure from many sources to conform to values that aren’t of the Catholic faith. Susan said she was struck by the sometimes poetic language that the Pope used. Susan said she also enjoyed a piece of the previous paragraph talking about words, where the Holy Father said that “…there are words which serve only to amuse, as fleeting as an empty breeze; others, to an extent, inform us; those of Jesus, on the other hand, must reach our hearts, take root and bloom there all our lives.” Scot said that the Holy Father used the theme of World Youth Day and themes from last month’s Gospel readings about fertile soil to encourage the youth to “grow in divine grace.” Greg said it was interesting to hear that he was reaching out to the youth in a more cerebral way, approaching the youth with great ideas and asking them to think about their reality more carefully. Greg continued to say that Pope Benedict seems to be also speaking out against the individualistic society – we should build communion among each other, not being alone. Greg said it was interesting to hear the Pope mention the word “friend” in respect to online activities – many people on their Facebook pages may have a thousand friends. The Holy Father was asking the youth to be careful not to dilute the meaning of the word. 3rd segment: Scot introduced a segment from Cardinal Seán’s catechesis session to English-speakers at World Youth Day on Thursday morning in Spain. Click here to listen to Cardinal Seán: What would it be like to be around Jesus when He was alive? Scot highlighted the Cardinal’s words that the Eucharist is an extreme expression of God’s love for us, and recalled that the founder of World Youth Day, Blessed John Paul II, often talked about love as self-gift or self-donation. Greg commented that he very much agreed with Cardinal Seán – this is only the second World Youth Day that Greg hasn’t been to. He said that it is difficult to sit at home and watch the coverage and wishing he was there to experience it, especially with three of his kids there – but came to the conclusion that even though he’d sell an organ to get a plane ticket to Madrid, he should be driven with the same exact zeal to go to church every single Sunday, not just to go to a large mass in Madrid. He emphasized that we need to remember that we can be part of the worldwide community of the Church every single weekend in our own parishes – no need to spend a thousand dollars on a plane ticket or travel to somewhere halfway across the world. Scot said that many of the pilgrims have shared that they’re excited to see the Pope – but that the Pope said he doesn’t want to be the star of the show, the star of the show should be Jesus Christ. Scot continued that it can be tough to bring the same excitement about a more routine Mass to a once-in-a-lifetime trip like World Youth Day, but that it is what we are all called to do. Susan said she was tickled to see that Cardinal Seán started his catechesis by drawing comparisons to Don Quixote – Scot commented that it isn’t surprising knowing that he has a doctorate in Spanish and Portuguese literature. Susan said another favorite part was when Cardinal Seán asked why, if so many youth can read Harry Potter books, could they not read the Bible as well? Cardinal Seán continued and said that many people do not get what they should from the Eucharist because they don’t ponder what they hear in the Gospel before receiving Jesus. Susan also said that one of Cardinal Seán’s common themes is that we live in an age of entertainment – everyone wants to be entertained all the time. We need to come to Mass to hear the Word of God, give Him glory, and receive the Eucharist, and Cardinal Seán did a great job reminding us that the Mass is not entertainment but growth. Scot said that the Cardinal sometimes preaches at Confirmations and asks the confirmands to know and have an appreciation for what is happening at the Mass so that they might keep coming back. Greg said the Cardinal’s answer to a question about the role of scripture in the Church stuck out to him as a former Protestant. Greg said he grew up being very connected to the Bible, and Cardinal Seán’s words were important because of how difficult it was to come to grips with the idea that the Church had curated and organized the Bible as we know it. Greg compared it to giving someone a photo album of your life – a viewer of the album would know that you were at a beach, or in a forest, but not if you were having a good time. They wouldn’t know if that was the vacation where you broke your toe or that it rained the whole time or that it was beautiful. In the same way, Greg continued, the Church’s tradition fills in the context to the scriptures – a very important part of our faith. the witnesses may not stand to gain anything from the death of the person. Greg said he thinks the important thing is that the Legislature avoid what we spoke about in the Netherlands several weeks ago – requirements started as stringent as the ones proposed here, and have slowly relaxed and become almost meaningless and are not enforced. Susan said the concept of euthanasia makes her crazy, and the possibility of people being given “death with dignity” without their permission is frightening. She continued, saying that the oversight board in one state is made up of doctors who perform these procedures – that kind of oversight isn’t effective or safe for the public in the first place. Scot said that we all need to be speaking up against this, as there’s a very well-funded lobby on the other side of the issue. Scot cautioned that if we don’t form ourselves, neighbors, kids, and friends, we’ll lose on this valuable issue like we have on many in the past. On a related note, Scot highlighted a short piece from the Pilot about Peter J. Cataldo, who was named this week as the first Chief Healthcare Ethicist for the Archdiocese of Boston. Scot said that Dr. Cataldo comes from a similar role in New Hampshire and spent 18 years at the Catholic Bio-Ethics Center as a policy lead as well. Scot explained that Dr. Cataldo will be helping oversee Catholic identity at the former Caritas Christi hospital now owned by Steward Health Care System. Greg talked about a final column from the outgoing Vicar General, Father Rich Erikson, entitled “A great privilege from every point of view.” In the column, Fr. Rich gives a farewell before going to Rome to study next month. Fr. Rich wrote about coming to know Cardinal Seán and respect his leadership, and how much he appreciates working with the Pastoral Center staff. Susan expressed that she had mixed feelings about Fr. Rich’s departure – while she is happy that Fr. Rich has the opportunity to go to Rome to study, she will miss his leadership, intelligence, and personality in the building every day. Scot said that Fr Rich will join us on The Good Catholic Life for a show on Friday, August 26th, and encouraged listeners to tune in to hear from Fr Rich directly. Scot quickly mentioned Dr. E Joanne Angelo, a Tufts University assistant professor of psychiatry and medical doctor who was named one of three recipients of the 2011 People of Life Award. Susan added that she lives in Cambridge and is a member of the Pontifical Academy for Life. Scot also brought up that two parishes will be getting new pastors – Father Thomas Keyes will move from St. Francis of Assisi parish in Medford to be the new pastor of Our Lady of Hope parish in Ipswitch, and Father Albert Faretra will be moving from his current position as pastor at St Joseph parish in Belmont to be the new pastor of St Blaise parish in Bellingham. Scot and Greg closed by discussing a gathering the annual Vianney Cookout that the priests of the Archdiocese have every year to fraternize and hear a speaker. This year’s speaker was Monsignor Peter Conley, a former Pilot editor. Greg said he wasn’t personally present, but that he was told Msgr Conley’s comparison of rectory life of the past and now as well as stories about Cardinal Cushing were well received by his fellow priests.